Harrah’s Online Casino is as glamorous as the offline casino you know well. If you’re looking to immerse yourself in a Mardi Gras atmosphere and collect loyalty points, then this casino is right for you. Plus, if you’ve played at Harrah’s in Vegas you’ll love that many of their offline games are available online. So you can play Raging Rhino, Monopoly, Jacks or Better and even blackjack from home. As you probably know, Caesars Entertainment owns Harrah’s. Their recent association with 888 casino and Ceasar allowed them to entertain players in NJ. If you’re looking to join Harrah’s casino but would like to know a little more about them, keep on reading to know the essential! 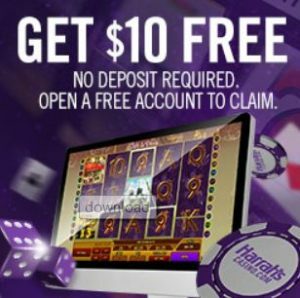 Alternatively, if you’re looking for a bonus and know everything about Harrah’s already you can create an account using this link to claim $10 on the house. At Harrah’s Online Casino you’re guaranteed to have a great time. This is because they have an amazing selection of games that will appeal to slot lovers, video poker enthusiast, and even table games professional. Indeed at Harrah’s players of all types and all budgets will find a game to have fun on. Harrah’s proudly distributing games from the award-winning developer NYX Gaming. NYX is renown for the partnership it creates with independent game studios. Which means that even if Harrah’s mainly distributes NYX’s game you’ll have the opportunity to try several games. You should also know that NYX is famous for the versatility of their games. But more importantly that Harrah’s has an app you can download on your cell. The app uses the same strick encryption mechanism as their website. So you can play with complete peace of mind in a safe and secure environment. Harrah’s Online Casino Welcome package is not only generous but it’s also really fair. Indeed, new account patrons start their adventure with $10 on the house. What’s really good about this bonus is that you won’t need to jump through hoops to get it. Simply create an account using this link and you’ll get the money once your account is valid. If you want to keep the fun lasting you can also claim their deposit bonus, it could give you as much as $600 to play with if you claim the full 100% bonus up to $300. Harrah’s has really fair wagering requirement that stipulates that you’ll need to turn over your bonus 10 times. So, if you deposit $200 you’ll need to play for $2000. The minimum play required to withdraw is easy to reach. This is because players can use their winnings to complete the wagering requirements. If you’ve been to Vegas you’re most probably familiar with it. Indeed, many hotels on the Strip which are part of Ceasar’s Group offer Harrah’s loyalty program. The loyalty program is the Total Rewards and if you already have a card you can link it quickly to your NJ casino account. Linking your card means that. You’ll automatically join the reward point happy hours promo when you play at the right time. So, you’ll earn as much as 5 times more points. The points you’ve accumulated in Vegas won’t expire since your account is active. You can exchange your points for bonuses and cashbacks. You’ll even earn points you can use for your next trip to Vegas. If you don’t have a card, don’t worry its easy to request one from Harrah’s website. Harrah’s website and APP are very well made. The navigation is instinctive and the site is very stable. So, chances are you won’t need to ever contact the customer care department. But anyways, if you wondered, they offer email support on NJSupport@harrahscasino.com. You can also speak with someone by dialing 1-800-542-7724. Harrah’s FAQ section is also very detailed. So if you have any questions with regards to deposits and withdrawals, you’ll find an answer there. We hope you’ve enjoyed this short review and remember to use this link to create your account. You wouldn’t want to miss out on $10 free right! Have fun!